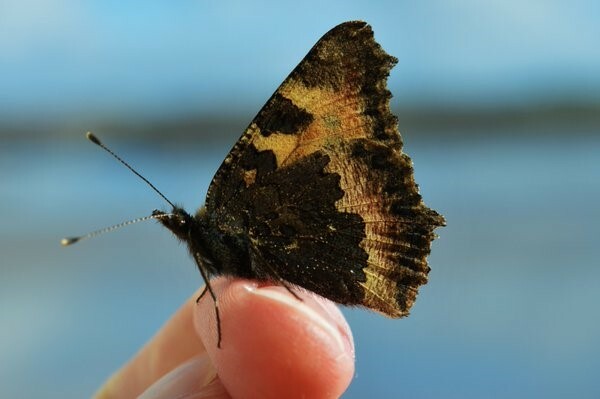 There are over 30 species of butterfly found in Ireland, some which carry out their full life cycle here and others which migrate. As with many other taxonomic groups there are some species which have restricted ranges, others which occur at lower densities and then some that are quite elusive. 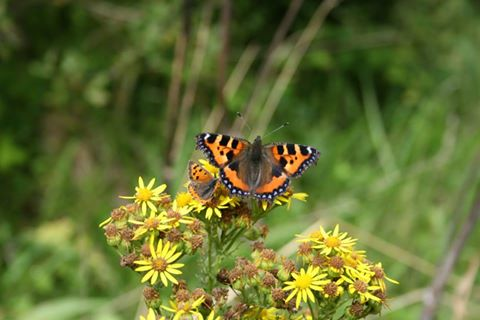 The Small Tortoiseshell is a common and widespread species of butterfly in Ireland and can be found in a range of habitats, including gardens, parklands and even wasteground. Identification is generally rather easy in Ireland as there are no confusion species. The forewings and hindwings both orange in colour with mottled black markings, which occur along the top fringe and middle portion on the forewing and spreading out from the main body in the hindwings. A black fringing interjected with blue marking is also a characteristic feature and this also occurs on both forewing and hindwing. The blue markings are extremely distinctive when the individual is fresh. The underside of the species is rather dull and is mainly a brown/black colour and if not basking can easily be mistaken for a leaf. The larval foodplant (the plant in which eggs are laid and then eaten by the hatched caterpillars) is Nettle (Urtica diocia). The caterpillars of this species have developed a defence mechanism to allow for a better chance of survival, this includes weaving a silken like web or tent to stop or at least hinder predation. The caterpillars are small and black when first hatched but eventually grow larger, without too much other change to their outward appearance. The species can be commonly seen in a variety of different habitats and areas across the country but can also be encountered nearer to winter, when it may fly into houses as a means to find a suitable hibernation spot. Unfortunately hibernating in a house is not the greatest idea as there can be great fluctuations in temperature (just think of how much heating and cooling goes on in a house during that period). 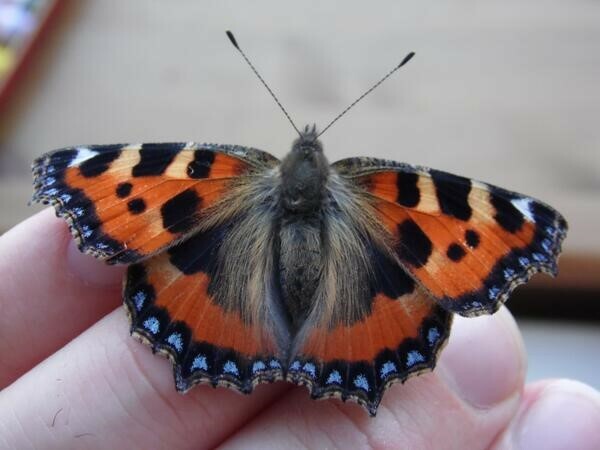 If you come across a hibernating butterfly in house (which is likely to be a small tortoiseshell) you can move it to an outside shed/garage (if you have one) or even keep it in a shoebox and put it in a cold room. The temperature here will be much more constant than in your house and the butterfly will be able to hibernate properly rather than waking up and moving around when there is a dramatic temperature change in your house. 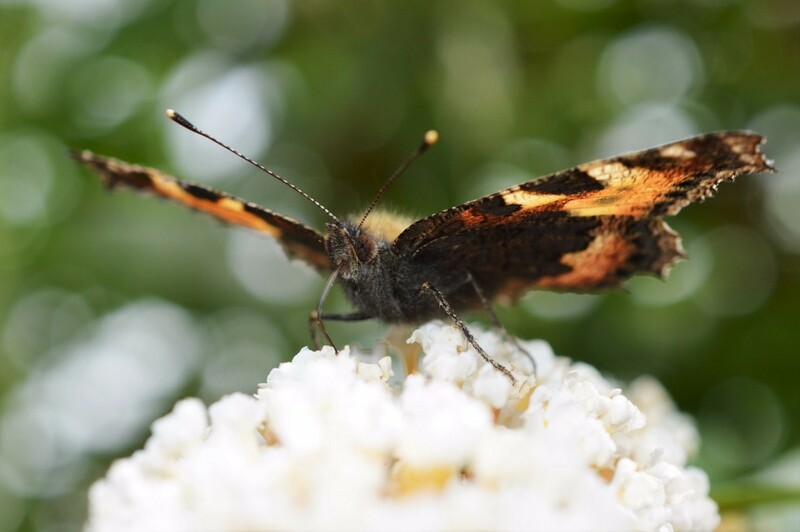 Name: Small Tortoiseshell (Aglais urticae) – Scientific names can often give a lot of information about the species you are looking at, for the small tortoiseshell Aglais refers to its overall genus while urticae pertains to its foodplant. Larval Foodplant: Nettle (Urtica diocia). When: Generally from April to September (although as mentioned above you may find one in your house over the winter). If anyone out there has any questions or suggestion regarding this piece or maybe regarding future pieces, feel free to get in touch through Twitter. Green politics in the UK: Serious politics or a way to win votes?